Jeduthan’s land was purchased in 1834. He died in 1837. Mary’s land was purchased in 1838, a year after his death. If you examine where each parcel of land was located you might notice something interesting. The entries in this database tell you where the land was located with what looks like a secret code. Jeduthan’s land is described as: NE1/4 of the NW1/4 in Township 12 South, Range 8 East in Section 32. 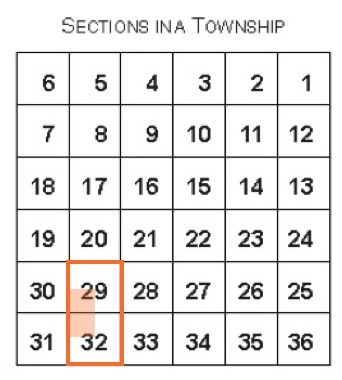 Mary’s land is described as: E1/2 of the SW1/4 in Township 29, Range 8 East in Section 29. 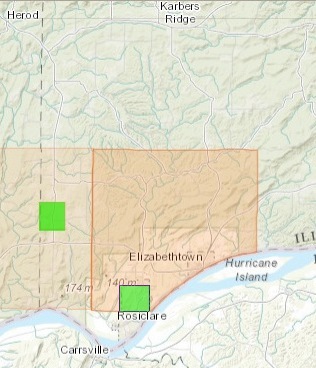 Sanders Scroggins land is within the green square on the left of the screen and Jeduthan and Mary Dimick’s land is within the square on the right. The families lived fairly close to one another, possibly attended the same church, social gatherings, or perhaps did business in the town of Rosiclare or Elizabethtown. Using land records puts the families in a time and place and in relation to each other. By doing this exercise, you can see how your ancestors may have interacted or maybe determine if you are even working with the correct ancestors. If they lived too far apart, it might be a case of mistaken identity. However with names like Sanders Scroggins and Jeduthan Dimick, I think I’ve got the right men. In the next several posts I will follow these men in vital, military and other records that are available online.